It’s not often an entire state can be united by the work of one person. Sure, Wisconsinites almost universally like JJ Watt – and his pizza delivering, pass swatting, gentle giant demeanor – but I personally know a couple people that could do without his constant media ads. Of all the people I’ve met from The Garden State, I have yet to find that isn’t a major fan of the artist highlighted today. Bruce Springsteen was born in September of 1949 in Long Branch, New Jersey. Growing up of Dutch and Irish ancestry, he was raised Roman Catholic and attended a religious school. His father was mostly unemployed, so times were generally tough for the family. The structure of religious education and the hard times of poverty forced Springsteen to grow up with a bit of a chip on his shoulder, and question authority. Looking for a change, he moved to a public high school but didn’t fit in there either. Teachers describing him as a “loner, who wanted nothing more than to play his guitar.” He finished high school, but didn’t attend his graduation ceremony because he felt uncomfortable doing so. Little did he know then, but these times of strife and confusion would be the very foundation to him hitting it big in the music business. In spite of signing with Columbia Records in 1972, Springsteen struggled mightily to find any real success. It would take a few years before he’d have a modestly successful album. 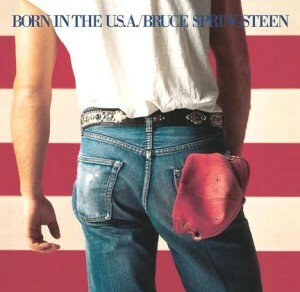 Today we’re looking at his seventh commercial release Born In The USA – which was released in June of 1984. Before this, Springsteen was known for darker lyrics and a more indie rock feel. This signified his first real attempt to embrace a livelier, mainstream sound – but attempt to blend it with the same darker lyrical content. The reception was immediately positive, with the title and cover art lending itself to being considered a patriotic work – focusing on an album for the common man, and the common struggles. It was almost as though the album was telling a story of triumph, of a man that overcame all the banalities of life and made something of himself. In the late 80s, it was labeled the fifth greatest rock album of all time, in a poll of 81 critics. In the more recent Rolling Stone version, it slipped down to number 85, still very high praise. Genre defining. That’s truly what this album is. It paved the way for what is now referred to as ‘heartland rock’ – artists like John Mellencamp, Bob Seger or even Tom Petty. Songs about grinding it out and enduring the hard times – a more real view of the world as told through great lyrics and song production. I think deep down, no matter what your background is, we can all relate to music like this. You can be down on your luck for a variety of reasons, but there’s no better feeling than beating the odds and getting past it. And the numbers tell a similar story, to date the album has sold nearly 40 million copies worldwide. It has an amazing legacy, one that has really cemented Springsteen’s image in music history. There’s so much more I could go into about his background, or the E Street Band, but that’s better served for my next blog about him. This album stands out too much on its own. So many reasons to pick this up today: reliving the mid-80s, cranking up an album that makes you want to stand up and shout USA! USA!, and don’t forget, it’s only $5 bucks. That’ll certainly make your Tuesday a little better.